Brian Lemmerman shares his thoughts on HighWaterLine|Miami and resiliency with Resilient Miami. Blair Butterfield, co-founder of Colony1 shares her thoughts on HighWaterLine and resilience with Resilient Miami. 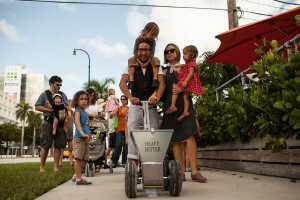 Adam Schachner shares his experience with HighWaterLine|Miami and making Miami more resilient with Resilient Miami. Nando Jaramillo shares his thoughts on making Miami more resilient with the Resilient Miami team. Matthew Toro, who created the maps and animations on Miami’s flooding, discusses his ideas on resilience and HighWaterLine with Resilient Miami. Marissa Prieto from CLEO Institute, discusses her ideas on resilience and HighWaterLine with Resilient Miami. Emily Eisenhauer discusses her ideas on resilience and HighWaterLine with Resilient Miami.